Hot off the electric production of Truth Or Dare in 2018, Indefinite Dance Company will return to Meat Market this month for the fourth time to stage their latest work, AFFIX. 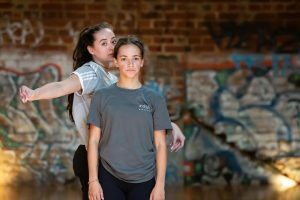 If you haven’t heard of Indefinite Dance Company, you will soon – founder Casey Chellew explains Indefinite Dance aims to offer opportunities for young dancers to extend their training. The pieces that Indefinite makes are concepts for young people to find relatable and truthful to everyone in some way; they aim to leave you thinking differently and feeling something; to explore the endless possibilities of contemporary dance and express this with beauty, intrigue and power. Casey Chellew, founder and choreographer, sat down with us to answer a few questions about AFFIX. Tell us a little about yourself! What brought you to the world of dance? My name is Casey Chellew, I’m 27 years old and absolutely in love with dancing. I started when I was 10 and haven’t looked back since. 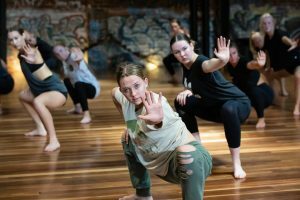 I’ve completed a Bachelor of Creative Arts Dance, a Certificate IV in Dance Teaching and Management, and I’ve been teaching dance for over 10 years. I’ve danced with many companies, performed in many performances and competitions, and taught many workshops around Victoria. I absolutely love choreographing and producing my own work – hence why I founded Indefinite Dance Company. Can you tell us a little about Indefinite Dance Com pany? I hold auditions to be part of the youth section of my company in December every year. I run this youth program for dancers aged between 12 and 17 from December to March, where we create a full length dance work together. The 25 dancers that make up AFFIX were selected by a panel of judges through an audition process. This audition was made up of both contemporary and lyrical movement as I required the dancers to be strong in both of these genres. My dancers this year come from all over Victoria, I have dancers from Berwick, Geelong, Ringwood, Traralgon and so on. They all dance at different dance schools around Victoria where they train during the year. It is so beautiful having dancers from all over coming together to work hard and inspire each other. This is your FOURTH time back at Meat Market! What draws you back to this space so often? I am in love with the atmosphere Meat Market has. I love the energy it fills me with as soon as I walk in. I love that everything can be set up to my requests and that I am allowed the freedom to use the space to reflect my specific production. It’s such a beautiful stage and space to dance on and I love giving my company dancers the opportunity to do that. What is the process like behind the show? Is it collaborative in terms of the choreography and what’s explored in the subtext? I am solely the choreographer, but I do give the dancers plenty of opportunity to play with my choreography and make their own choices with what they want to do with it. I love for dancers to really embrace who they are as movers and be free to explore how they move and interpret things like music or certain tasks. In terms of developing ideas for the show, I love to include all of the dancers, not only so they feel more connected to the work but so I can bounce off their ideas and opinions as well as my own. I use a process I like to call ‘circle time’ where we all sit in a circle and either discuss certain topics or we each take notes, sometimes we take turns to read them allowed or I take everything home and read it and compile things from there. I find it a really rewarding process and I love how involved the girls get. We’ve seen a number of outstanding productions by young people with indefinite dance – can you tell us a little about AFFIX? AFFIX is all about human connection. What we connect to, how we connect to it, what we feel about being connected to certain things. Each dancer will explore what connects them to their world. What’s next for you after AFFIX? I always have projects going on with Indefinite Dance Company! However, my next production project will be a choreographic development program in October. This is a program I started last year called ‘In Bloom’ which I have decided to run annually. 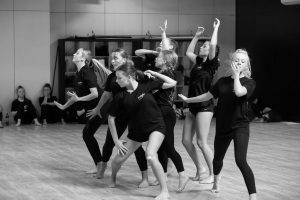 This one is for dancers aged 15+ and is where they have the opportunity to choreograph the pieces themselves. Last years show was so special to me and I can’t wait to see what happens this year. AFFIX plays at Meat Market from 30 – 31 March. Get your tickets at Trybooking. Discover more about Indefinite Dance Company on Facebook and Instagram. Photography by Mish Mackay.